Oswald’s core value of “Commitment to Community” is embraced by our employee-owners, and often appears to be built into the DNA of our team members throughout all of our regional locations. 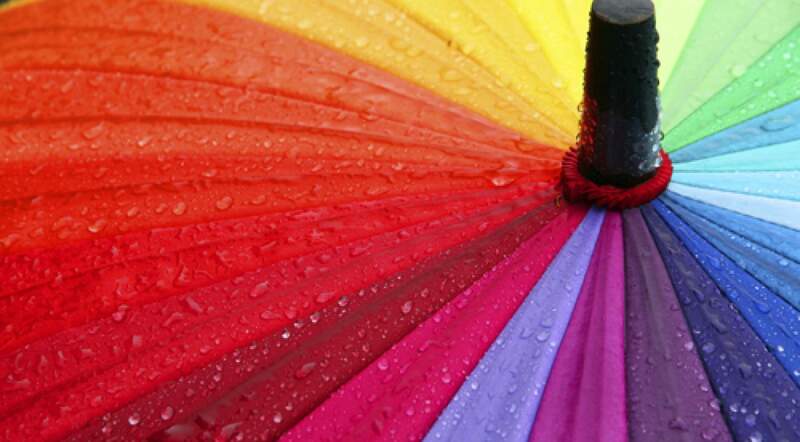 In fact, the volume of activity had grown so widespread, that in 2015 ‘Oswald Cares’ was launched as an internal initiative to bring all fundraising and volunteering opportunities under one umbrella. The program, established by employee-owners Sue Smith and Sue Russo, now has its own online hub on the intranet, and features a comprehensive calendar, blog feed for news and events, resources regarding major campaigns and committee bios, and much more. Through our non-profit partners, and additional organizations to which we dedicate time and resources, we’re reminded daily of the hardships in our own backyards, the regional communities we serve, and well beyond. The following are several recent programs that we hope will inspire you and your organization to continue to find creative and meaningful ways to support those in need. In response to the Flint, Michigan crisis, Jake Madigan of our Detroit office led a fundraising campaign across the company that raised a total of $1,725.00. This allowed the team to buy 10 pallets of water (480, 40-pack cases) for a total of 19,200 bottles of water. The water was delivered to St. Mark’s Missionary Baptist Church in Flint. 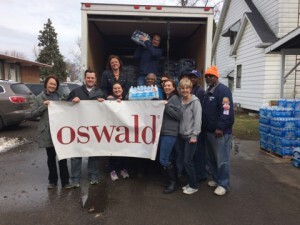 “The citizens of Flint were immensely gracious for the substantial donation, and Oswald certainly left a positive foot print in such a negatively affected city,” said Madigan. The Oswald Columbus team participated in the Mid-Ohio Foodbank’s Operation Feed Campaign. The team collected 102 containers of food equaling 102 pounds, and $100 ($1.00 = 4 meals). According to Operation Feed, it provided 502 meals for families in need. After the holiday giving, food banks can find their shelves in need of stocking for the winter months. In addition to its ongoing Harvest for Hunger campaign with the Cleveland Foodbank, which has raised more than $2,000 this year alone, Oswald came together in late January for a special drive to benefit the Akron Canton Regional Foodbank. Collective efforts of food and donations provided 1,160 meals to those in need. The Cincinnati team also dedicates “Days of Caring,” where the staff volunteers their time at the regional Foodbank. On March 10, as part of a Women’s Leadership program, more than 100 employee-owners donated gently used clothing and accessories to the Westside Catholic Center. The Center, which serves the impoverished of Cleveland through its many critical programs, used the donations to supply clients in its Womens’ and Children’s Shelter, as well as career transition program, to support women with interviews and sustaining jobs. Through a partnership with Oswald’s Toledo Office this March, Ron Boynar, Sales Associate, drove this initiative by collecting socks and donations for Hannah’s Socks, to support the less fortunate in Ohio and Southeast Michigan. In addition to our United Way partnerships, Junior Achievement is another core mission of Oswald Cares, with many events throughout the year, including nearly 20 volunteers set for Blitz Day teaching at the Clara Westropp School on April 29. These programs are a sample of the actions taken each week in all of our divisions. In addition to financial support each year for our partners, Oswald donates significant time and talents to employee-owner driven and managed initiatives. To learn more about what it means to be an employee-owner at Oswald, as well as our commitment to service, explore our career site at www.OswaldCompanies.com/careers.